Kansai International Airport (関西国際空港 Kansai Kokusai Kūkō?) (IATA: KIX, ICAO: RJBB) is an international airport located on an artificial island in the middle of Osaka Bay, 38 km (24 mi) southwest of Ōsaka Station, located within three municipalities, including Izumisano (north), Sennan (south), and Tajiri (central), in Osaka Prefecture, Japan. The airport is off the Honshu shore and was designed by Italian architect Renzo Piano. The airport serves as an international hub for All Nippon Airways, Japan Airlines, and Nippon Cargo Airlines, and also serves as a hub for Peach, the first international low-cost carrier in Japan. It is colloquially known as Kankū (関空?) in Japanese. Kansai opened 4 September 1994 to relieve overcrowding at Osaka International Airport, which is closer to the city of Osaka and now handles only domestic flights. During the 2006 fiscal year, KIX had 116,475 aircraft movements, of which 73,860 were international (31 countries, 71 cities), and 42,615 were domestic (19 cities). The total number of passengers was 16,689,658 of which 11,229,444 were international, and 5,460,214 were domestic, sixth in Japan and second in Osaka area. However, in 2009, airport traffic has fallen by almost 20% in just two years to 13.4 million. In 2010 airport traffic had risen to over 14 million, with international passengers accounting for approximately 10.4 million and domestic passengers accounting for approximately 3.7 million. Freight volume was at 802,162 tonnes total, of which 757,414 t were international (18th in the world), and 44,748 t were domestic. The 4,000 m × 60 m (13,123 ft × 197 ft) second runway was opened on 2 August 2007. As of June 2014, Kansai Airport has become an Asian hub, with 780 weekly flights to Asia and Australasia (including freight 119), 59 weekly flights to Europe and the Middle East (freight 5), and 80 weekly flights to North America (freight 42). In the 1960s, when the Kansai region was rapidly losing trade to Tokyo, planners proposed a new airport near Kobe and Osaka. Osaka International Airport, located in the densely populated suburbs of Itami and Toyonaka, was surrounded by buildings; it could not be expanded, and many of its neighbours had filed complaints because of noise pollution problems. After the protests surrounding New Tokyo International Airport (now Narita International Airport), which was built with expropriated land in a rural part of Chiba Prefecture, planners decided to build the airport offshore. The new airport was part of a number of new developments to revitalize Osaka, which had been losing economic and cultural ground to Tokyo for most of the century. Initially, the airport was planned to be built near Kobe, but the city of Kobe refused the plan, so the airport was moved to a more southerly location on Osaka Bay. There it could be open 24 hours per day, unlike its predecessor in the city. 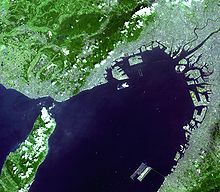 Satellite photo of Kansai Airport (lower-right island) in Osaka Bay. Kobe Airport is being built on the unfinished island near the middle of the photo. Central Osaka is in the upper-right corner, along with Osaka International. An artificial island, 4 km (2.5 mi) long and 2.5 km (1.6 mi) wide, was proposed. Engineers needed to overcome the extremely high risks of earthquakes and typhoons (with storm surges of up to 3 m (10 ft)). Construction started in 1987. The sea wall was finished in 1989 (made of rock and 48,000 tetrapods). Three mountains were excavated for 21,000,000 m3 (27,000,000 cu yd) of landfill. 10 000 workers and 10 million work hours over three years, using eighty ships, were needed to complete the 30-metre (98 ft) layer of earth over the sea floor and inside the sea wall. In 1990, a three kilometer bridge was completed to connect the island to the mainland at Rinku Town, at a cost of $1 billion. Completion of the artificial island increased the area of Osaka Prefecture just enough to move it past Kagawa Prefecture in size (leaving Kagawa as the smallest by area in Japan). The bidding and construction of the airport was a source of international trade friction during the late 1980s and early 1990s. Prime Minister Yasuhiro Nakasone responded to American concerns, particularly from Senator Frank Murkowski, that bids would be rigged in Japanese companies’ favor by providing special offices for prospective international contractors, which ultimately did little to ease the participation of foreign contractors in the bidding process. Later, foreign airlines complained that two-thirds of the departure hall counter space had been allocated to Japanese carriers, disproportionately to the actual carriage of passengers through the airport. The island had been predicted to sink 5.7 m (19 ft) by the most optimistic estimate as the weight of the material used for construction compressed the seabed silts. However, by 1999, the island had sunk 8.2 m (27 ft) – much more than predicted. The project became the most expensive civil works project in modern history after twenty years of planning, three years of construction and fifteen billion (US) dollars of investment. Much of what was learned went into the successful artificial islands in silt deposits for New Kitakyushu Airport, Kobe Airport, and Chūbu Centrair International Airport. The lessons of Kansai Airport were also applied in the construction of Hong Kong International Airport. In 1991, the terminal construction commenced. To compensate for the sinking of the island, adjustable columns were designed to support the terminal building. These are extended by inserting thick metal plates at their bases. Government officials proposed reducing the length of the terminal to cut costs, but architect Renzo Piano insisted on keeping the terminal at its full planned length. The airport opened in 1994. On 17 January 1995, Japan was struck by the Kobe earthquake, whose epicenter was about 20 km (12 mi) away from KIX and killed 6,434 people on Japan’s main island of Honshū. Due to its earthquake engineering, the airport emerged unscathed, mostly due to the use of sliding joints. Even the glass in the windows remained intact. In 1998, the airport survived a typhoon with wind speeds of up to 200 km/h (120 mph). On 19 April 2001, the airport was one of ten structures given the “Civil Engineering Monument of the Millennium” award by the American Society of Civil Engineers. As of 2008, the total cost of Kansai Airport was $20 billion including land reclamation, two runways, terminals and facilities. Most additional costs were initially due to the island sinking, expected due to the soft soils of Osaka Bay. After construction the rate of sinking was considered so severe that the airport was widely criticized as a geotechnical engineering disaster. The sink rate fell from 50 cm (20 in) per year during 1994 to 7 cm (2.8 in) per year in 2008. Where can I find the baggage delivery counter? Counters are located at both the northern and southern ends of the 1st (International Arrivals) and 4th (International Departures) floors of Terminal 1 Building. (There are no counters in the Passenger Terminal 2 Building.) The 4th floor counter offers a pick up service for carry-on baggage (Delivery of baggage between your house and the airport / Please book over the phone 3-4 days before your flight). The 1st floor counter offers a delivery service for souvenirs brought back from overseas and suitcases. The 7-Eleven on the 1st floor of the Passenger Terminal 2 Building also offers a delivery service. As a general rule, the only animals allowed in the Passenger Terminal Building are guide dogs and service dogs. However, small animals are allowed under the proviso that they are kept in a cage at all times and do not annoy other customers. Please see the Ministry of Agriculture, Forestry, and Fisheries Animal Quarantine Service for information regarding transporting pets overseas. Please consult your airline regarding the relevant procedures for sending pets. Ask your airline directly about sending pets within Japan. What provisions are made for the visually-impaired? Braille blocks lead from train platforms and bus stops to the central information counter on each floor. The staff at the information counter will be happy to guide you to the check-in counter for your airline. Airline staff will guide you onto your aircraft from the check-in counter. When arriving Braille blocks will also guide you to the central information counter and to the bus stops and airport station. Staff will also guide you from the information counter to the bus stops, airport station or car park. I’m driving to KIX. Is it possible to drop off a wheelchair close to the entrance of the Passenger Terminal Building? There are wheelchair ramps for disabled customers on the International Arrivals (1st floor) and International Departures (4th floor) of the Teminal 1 Builing in both the ordinary traffic and taxi lanes. There is an interphone at the drop-off area on the 4th floor that connects to the Central Information Counter on the same floor. Feel free to call the Information Counter staff if you would like to rent a wheelchair or require assistance. The Information Centers in the Passenger Terminal 1 and 2 Buildings and the Information Counters on every floor issue discounted parking coupons for disabled customers. Remember to bring your Disabled Persons Pass Book (Shintai-shogaisha Techo) and original parking slip to receive parking coupons. What number do I call for the lost and found desk? The place where you should inquire about lost property will differ according to where the item in question was lost. Call Kansai International Airport Information (Ph:+81(0)72-455-2500) for general inquiries regarding lost items. If you are at the airport, either ask at the Information Center on the North side of the 2nd floor or any of the Information Counters on each floor of the Passenger Terminal 1 Building, or at the Information Center in the center of the Passenger Terminal 2 Building. If you have lost an item outside the area that Kansai Airports is responsible for, we may not be able to assist you directly. However we can provide you with contact information for the relevant authorities.